I suppose I’ve failed to mention the gold mine of photos and information that Grandma found stashed in her closet last summer when we were in there looking for something else. (Isn’t that always the case?) Apparently, many years ago Grandpa received a book about the Hastings family history, as documented by a distant relative of his. The book is wonderful, but the best part is that our relative, Roger Taft, included a disc with all of his scans of the original documents and photos that he put into the book. I can’t even begin to describe how amazing this is. A few of these photos we had copies of, some others I’d seen online, but there are many I’d never even seen before. Thank you cousin Roger, wherever you are! This photo is of Z.S. 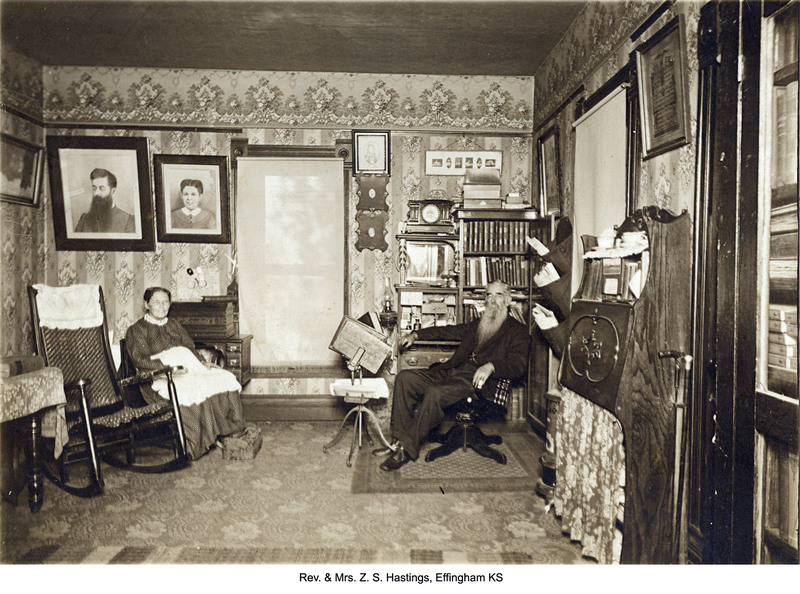 Hastings and Rosetta Butler Hastings (my great-great-great grandparents) inside their “retirement” home in Effingham, Kansas. Note the paintings of Z.S. and Rosetta Hastings that hung on the wall behind them. This picture cracks me up. I don’t have an exact date for the photo, but I imagine it was taken in the early part of the 1900’s. Z.S. Hastings died in 1925, so I believe this photo to have been taken 5-15 years earlier based on the way he looks in other photos we have of him which are dated 1914 and 1925.